Right you are, Alf. I think those are the slots seen just forward of that outer flap section. I don't know how that works...a "finer point" for me. Directing "extra" air flow over the ailerons? 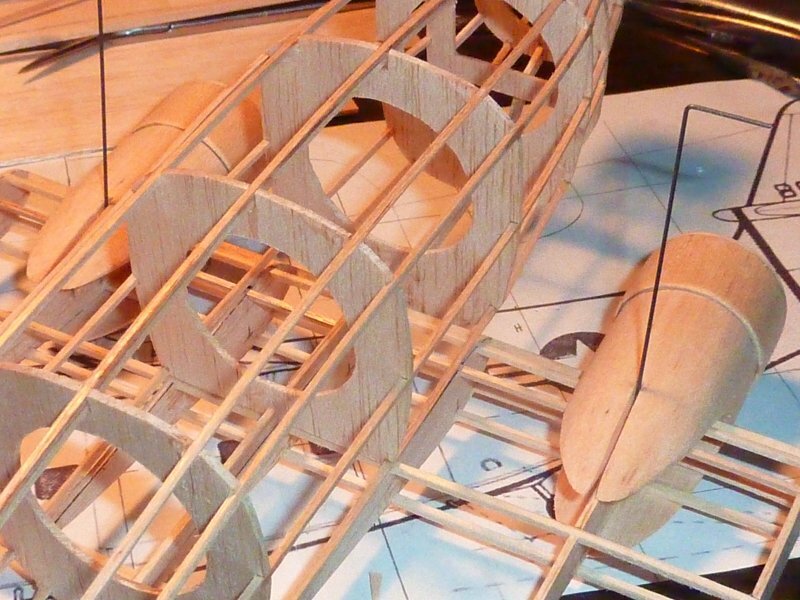 Well Howard...ws is variable...I mean, depends upon which outer wing panel I choose to model from my enlarged 3-view. Like I mentioned to Paul earlier...checking things with dividers...everything checked out until I got to those outer panels...one is a bit longer than the other. Sooooo...with one serving as the pattern for both...it'll be 21.5"...the other 21". Gary...if I tried to accomplish what you, Mike, and Mark are doing...the model would own me...not the other way around. As my kids would attest..."Dad is not long on patience." Google says the airplane also used spoilers to assist in roll control. Thank you for that wonderful compliment. Truth be told, I thought you'd be in the big leagues with that incredible insight and imagination to designing and building a fantastic model from simple three views. I'll just sit quetly and watch. Just wonderful that you have shared with us all of your effrorts. As you learn, so do we..... I'm learning a lot through you. Thank you! Remember, Giant no-cals are profile models, they can swing a larger prop on the nacelles than a full bodied model and as for the landing gear to clear the nose prop, well, the rules say "recognizable scale". BTW, what is the span on your model? I think this is the photo you're referring to, Alf...middle ac is a biplane. You really can identify that airfield from that view?!!! That's amazing! 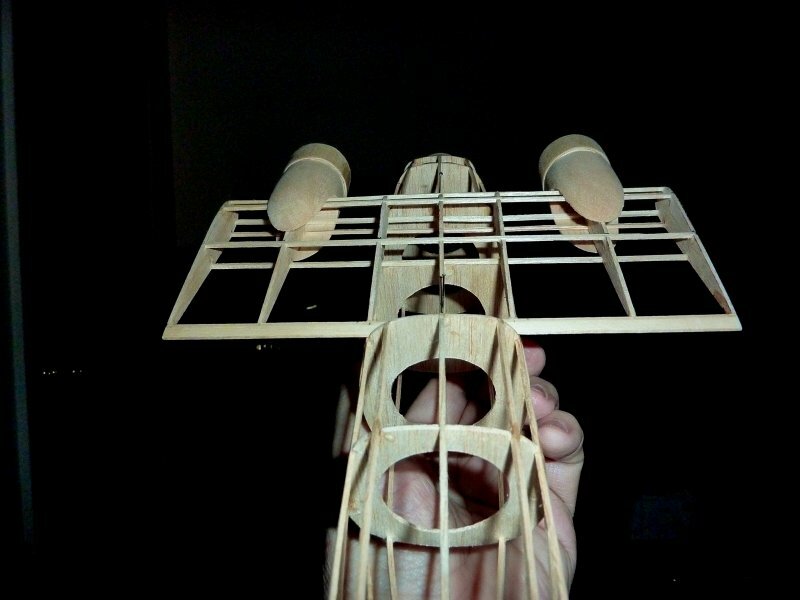 Something that one might see in this photo is the small size of the ailerons. The 125 was classified as an STOL type aircraft and as such had lots of flap area...but I'm still amazed at how small those ailerons are! Neal - I remain greatly impressed with your work. Straight stringers, smooth outlines, well done notches. All that early work translates into a nice covering job. Keep up the good work. PS - What make is your scroll saw? That works!! The gear struts don't need the support of the nacelles and this lets the wing be covered before the nacelles are attached. 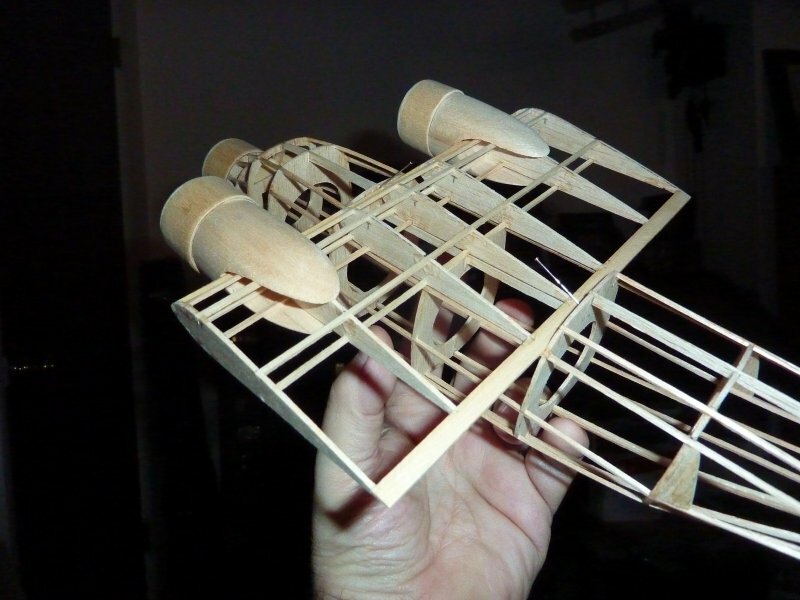 Much easier than building the nacelles into the wing as I did with the Couzinet. I bet the weight is about the same too!! 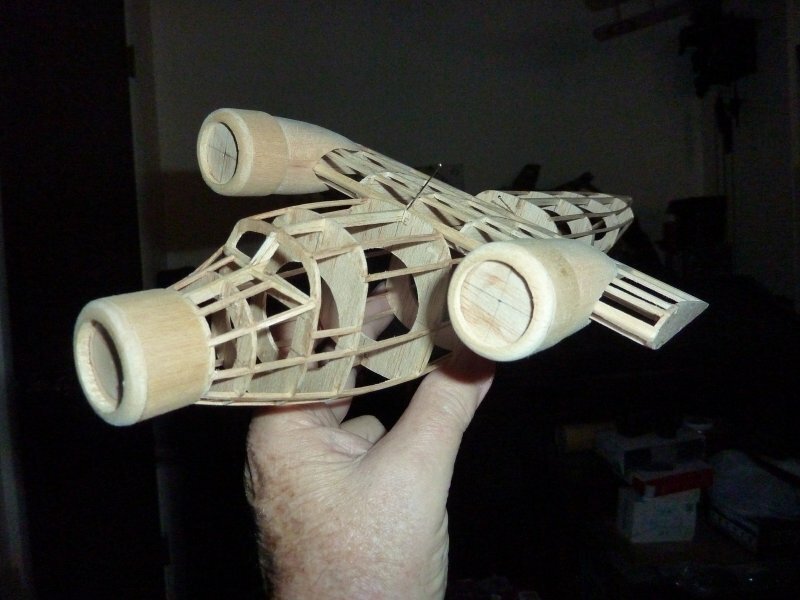 You did a nice job on turning those nacelles! I wish I had some more tools!! I agree about the scrap wood. I save anything of any practical size, something will come along later where I can use the piece. 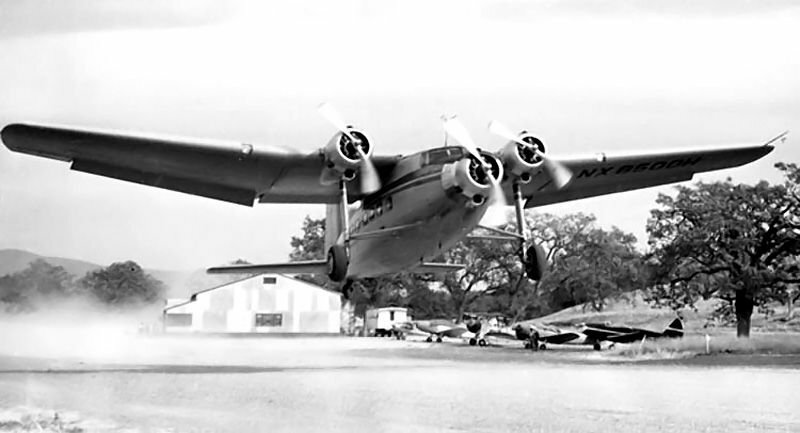 In an earlier post, the re is a pic of the airplane taking off from the Conejo airport in Ca. It reminds me of the Rocketeer movie with the old planes in the background! I knew the solution would present itself. I'm with you...I keep all disc's cut from balsa. They always come in handy for wheels/tires, stacked and turned for spinners etc. LG/nacelle problem solved...cut a small slot in nacelle bottom to allow sliding into place over the LE. 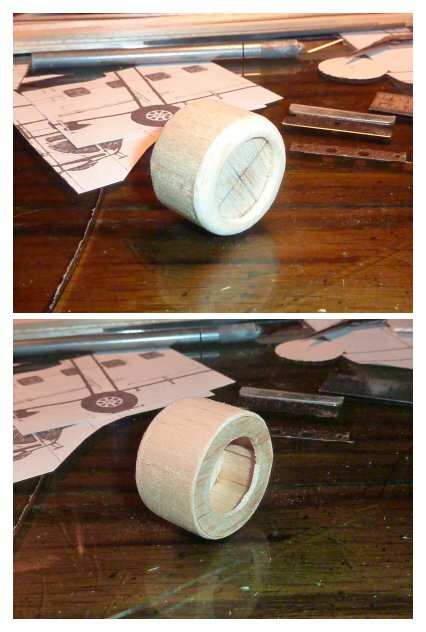 Slot can be filled later with balsa...or just covered over with tissue. LG wire is affixed to rib with balsa/ca sandwich...hmmmm good. Beats the old way of sewing it into place with mom's needle and thread. LG wire sized to fit inside 1/16" aluminum tubing (wheel bushings). 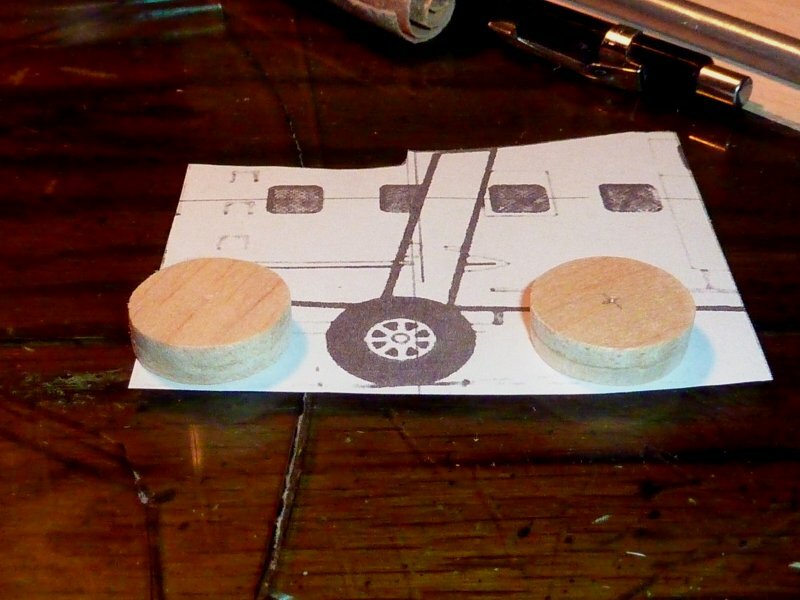 Wheel blanks are from cowl ring cutouts...exact size needed. I never throw away discs that I've meticulously had to cut out...usually from bulkheads, etc. Save them in a plastic bag...lots and lots of them...always come in handy. Looking good! I'm sure a solution will come to your about the landing gear! Got some engines/cowlings constructed...little bits that are essential for the build. By some miracle, the cutout discs for the cowling rings are the exact diameter of the main gear wheels...isn't that convenient! Paul...practice is doing...jump right in...choose a flat-sided ac and have at it. Find a good 3-view first...then go for it. In this case mistakes are "good," that's what you'll learn from. Scratch-building is an extension of ourselves.... I used to have a cartoon in my office...a monkey holding a coin cup...looking back at the organ-grinder. The monkey was thinking, "I could do that." It's true! Hey...we're all "wannabees" here. Go ahead...nothin' to it! 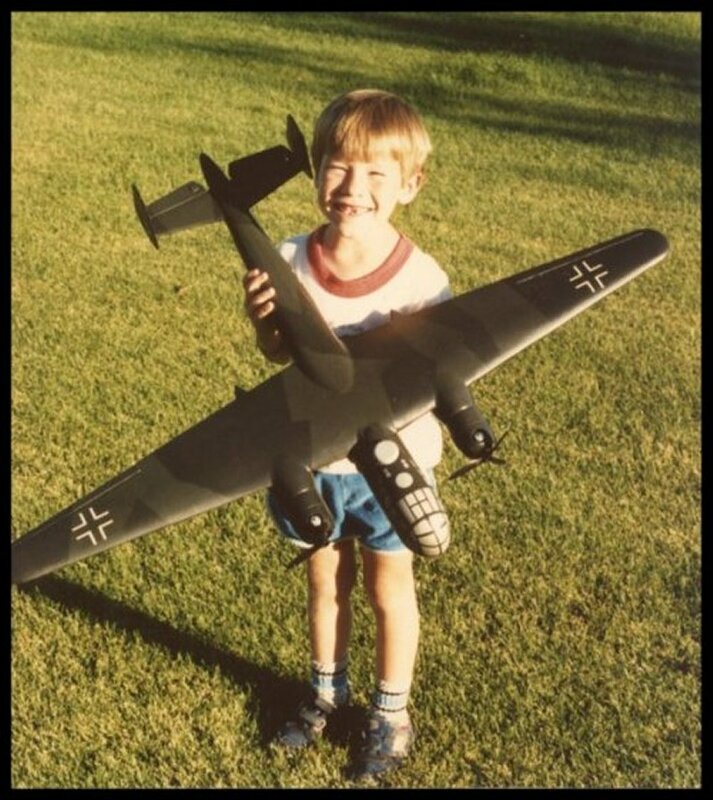 Invent your own airplane! Don't worry...be happy...there is no such thing as perfection! Thanks for the offer, Gary. I think our models reflect something of our own temperament...I'm an impatient soul. You on the other hand, are meticulous and dedicated. Your models are truly...museum exhibits of the first order. You're an exception in our hobby, Gary...that is, you're exceptional. The first time I viewed photos of your SE5a...wow! I'm down here in the "D League" and you're up there in "The Bigs." Watching you through this build is a inspirational experience. As time alots I have been reading up on how to use my scale tools agine. Hope in the near future to build a plane from a three view. But much practice is needed before that happens. Keep up the great work and I look forward to seeing this bird come alive. Yeh Howard...those were the days. Speaking of nacelles...like to formally introduce you to my youngest son (of three)...holding dad's Do217 rc ship (scatch). 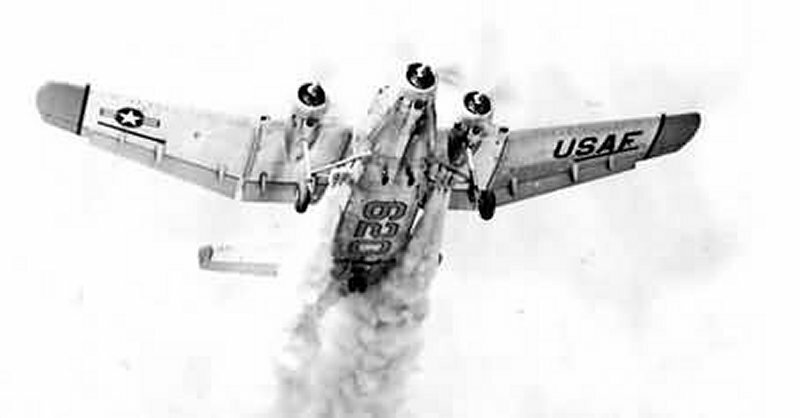 The way that wing sits on the fuselage...kinda looks like the same arrangement as the YC-125, at least near the TE. Oh...my son...he's 40 years old now.